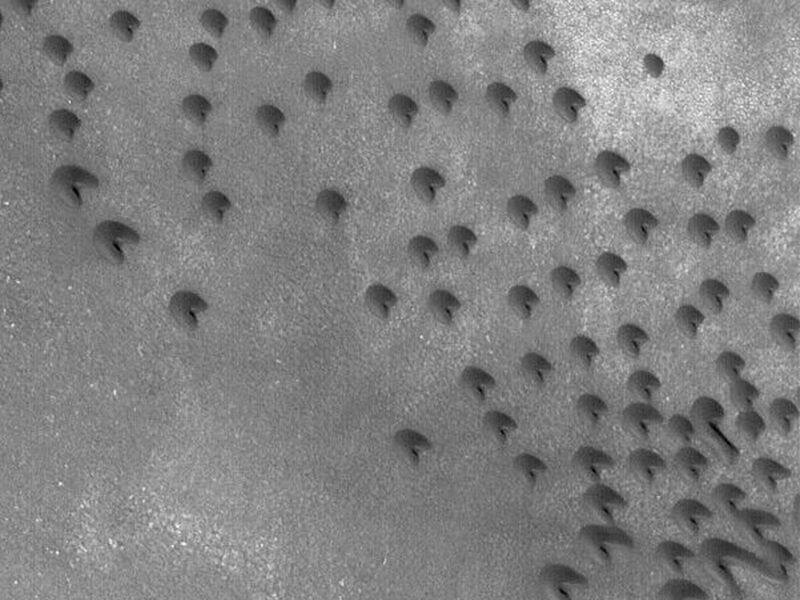 This Mars Global Surveyor (MGS) Mars Orbiter Camera (MOC) image shows north polar sand dunes in the summertime. During winter and early spring, north polar dunes are covered with bright frost. When the frost sublimes away, the dunes appear darker than their surroundings. To a geologist, sand has a very specific meaning. A sand grain is defined independently of its composition; it is a particle with a size between 62.5 and 2000 microns. Two thousand microns equals 2 millimeters. 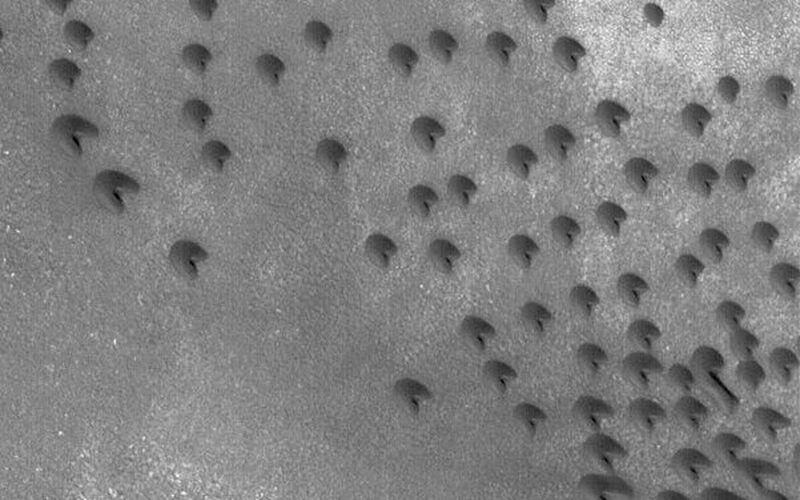 The dunes are dark because they are composed of sand grains made of dark minerals and/or rock fragments. Usually, dark grains indicate the presence of unoxidized iron, for example, the dark volcanic rocks of Hawaii, Iceland, and elsewhere. 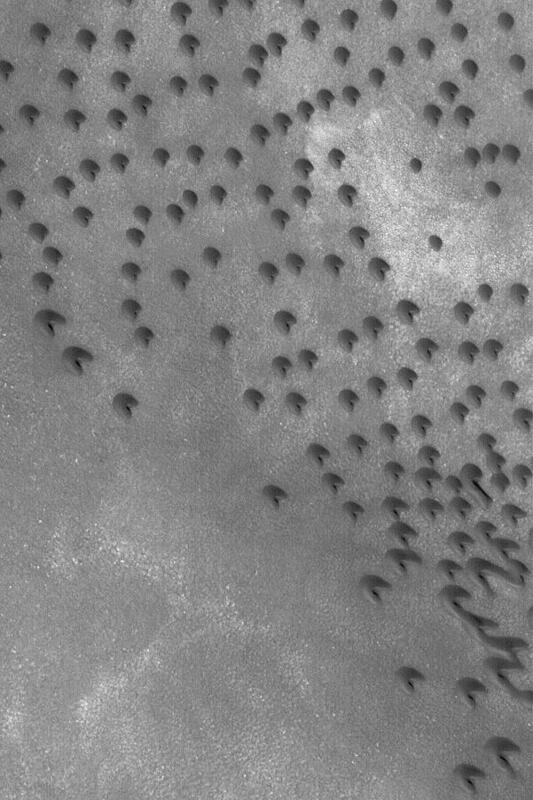 This dune field is located near 71.7°N, 51.3°W. Dune slip faces indicate winds that blow from the upper left toward lower right. This picture covers an area approximately 3 km (1.9 mi) across and is illuminated by sunlight from the lower left.